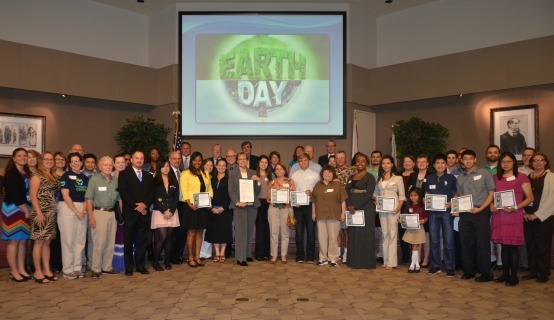 As a fitting tribute, Orange County Mayor Teresa Jacobs recognized participants in the environmental Volunteer and Internship Program (eVIP) on Earth Day at the Board of County Commissioners meeting. The Environmental Volunteer and Internship (eVIP) program, coordinated by Orange County’s Environmental Protection Division, offers citizens several volunteer opportunities to improve and protect the region’s diverse ecosystem. In 2013, 491 volunteers and students contributed nearly 3,000 hours to the community by participating in various projects and internships. Projects included labeling storm drains, sampling surface water at various Adopt-A-Lake locations, land management projects and conducting educational presentations. The combined time of these outstanding volunteers is valued at over $50,000.